It is actually quite easy to print from your internet-connected laptop and there are 3 methods available to you. 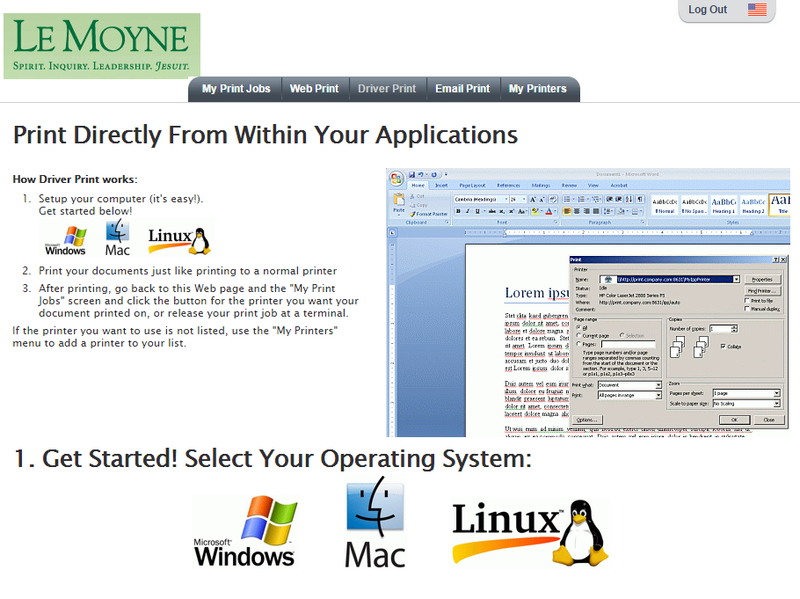 Web Print – A simple web interface for printing documents on Le Moyne public printers. Simply upload a file in any of the supported document types and select which printer to send it to. Supported document formats include Microsoft Office, OpenOffice, PDF, JPG, GIF, PNG, TIF, BMP, TXT. 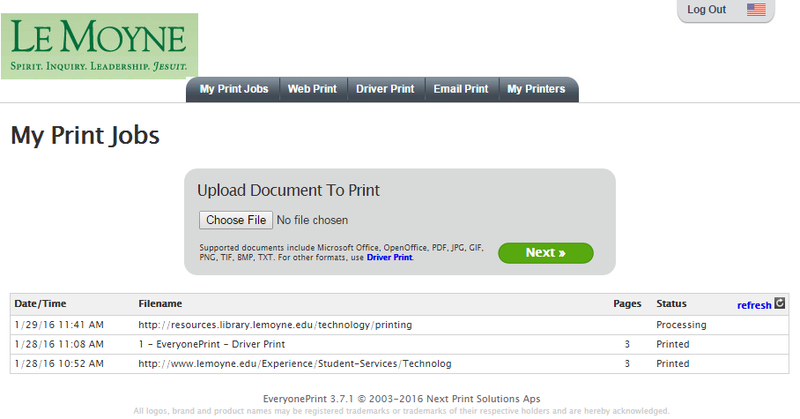 Driver Print – If you are using other file types, such as Apple products including Pages, Numbers, or Keynote, you will need configure one of the Le Moyne public printers as an internet printer on your laptop. 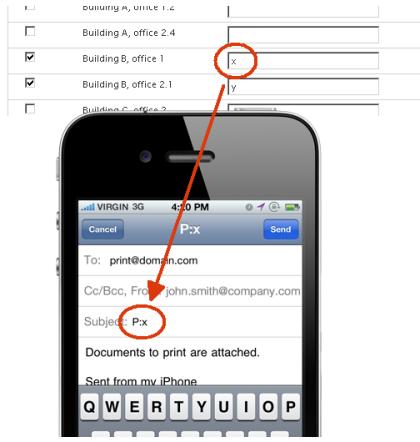 Email Print – If you are using a smartphone or tablet, then quite likely you will need to use the "Email Print" method. The exception is if you want to print a web page; then just enter the URL into the "Web Address to Print" form. You can also set up favorite printers in My Printers to make it easier and more certain about which printer you are sending your important document to. Please make certain you sent your print requent to your intended printer before printing it a second time. MyPrint is a service maintained and supported by the Information Technology department. Contact the IT Service Desk at (315) 445-4579 or email servicedesk@lemoyne.edu with questions or support issues. See also: IT's "Printing On Campus" help page. Login into your MyPrint account using your Le Moyne network credentials. The URL is https://myprint.lemoyne.edu/. Note this is a secure URL; if you leave the "s" out of the "https" protocol, the page will not display. If you have any items queued for printing, they will be listed on the "My Print Jobs" tab. Completed print jobs remain listed for a few hours to remind you to go pick them up. In the example below, 3 Library printers have been defined and given nicknames using the "My Printers" option. In the example below, we want to send our print job to the "LibCluster" (nickname for "Library Cluster") printer. When ready, click the button to send the print job into the print queue. If you click the "Advanced" checkbox, you can control the numbers of copies to print, the range of pages, and whether to print double-sided or not. 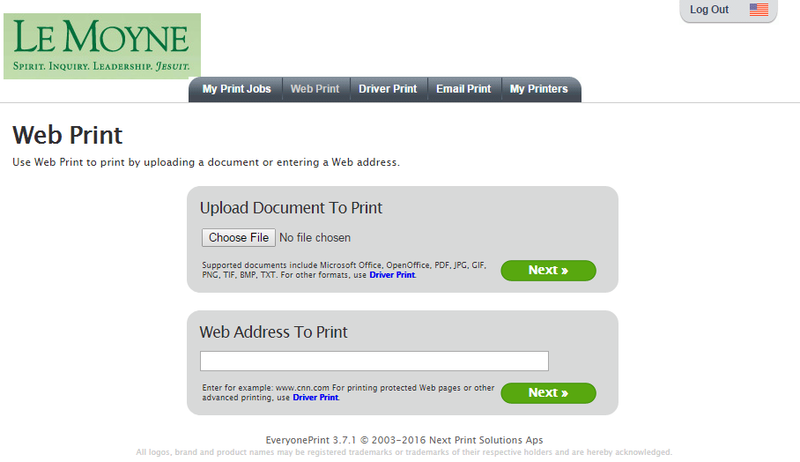 Use "Web Print" to print by uploading a document or entering a web address. After you send a file to MyPrint, it will be held as "Processing" until you select a printer. See "Getting Started" for instructions. Detailed step-by-step instructions for setting up "Driver Print" on your laptop are given on the MyPrint website. Windows, Macintosh, and Linux operating systems are supported using this method. Chromebooks, smartphones, and tablets are not supported and should instead use the "Email Print" option. Once you choose your operating system. there are two configuration options for "Driver Print": "Simple (1)" and "Simple Direct (2)". If you choose the "Simple (1)" option, you won't be asked to specify a specific printer during set up. That means that after you send a document to the print queue, it will be held until you go to the "My Print Jobs" screen on the MyPrint website and select the button for the printer you want your document printed on. If you opt for the "Simple Direct (2)" configuration, you will be asked to specify the printer you want to print to. That means that you won't need to use the MyPrint interface to release the job; it will be printed immediately on the printer you configured. If you need to print to several different printers, you can add them as additional print options. By attaching and sending a document to "myprint@lemoyne.edu", you will be able to print documents from smartphones and tablets that would be otherwise difficult or impossible to do. You must use your "username@lemoyne.edu" email account for this option to work. Print requests sent using "Email Print" will be held as "Processing" in the MyPrint interface until you select a printer. If you have defined nicknames for printers in "My Printers", you can specify it in the Subject Field of the email which printer to use to print the document. For example, if I want to send a document to be printed on the "Library Cluster" printer, because I have given it a nickname of "LibCluster", I would put "P:LibCluster" in the subject of the email. 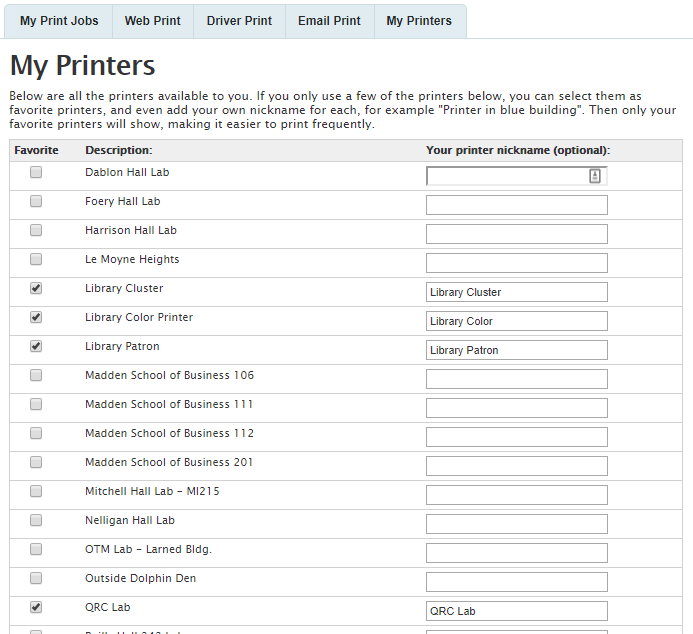 The "My Printers" list is a way to reduce the number of printer options that will be shown in the "Web Print" interface. It can be confusing to know which printer is which, even in buildings where you often go, so paring the list down to just printers you know can help prevent sending your private documents to an incorrect location. If you check-mark any printers as "Favorites", then when you print, you won't see the full list of public printers on campus, only those you pre-defined. In the example below, we have specified 3 printers located in the library: "Library Cluster" which we nicknamed "Library Cluster", "Library Patron Printer" which we nicknamed "Library Patron", and "Library Color" which we nicknamed "Library Color". We also specified the "QRC Lab" as "QRC Lab". See the "Printers in the Library" box for locations of each of these printers. While nicknames are completely optional, they can be helpful if you use the "Email Print" option, since you can define easily remembered and typed nicknames. MyPrint only serves public printers. 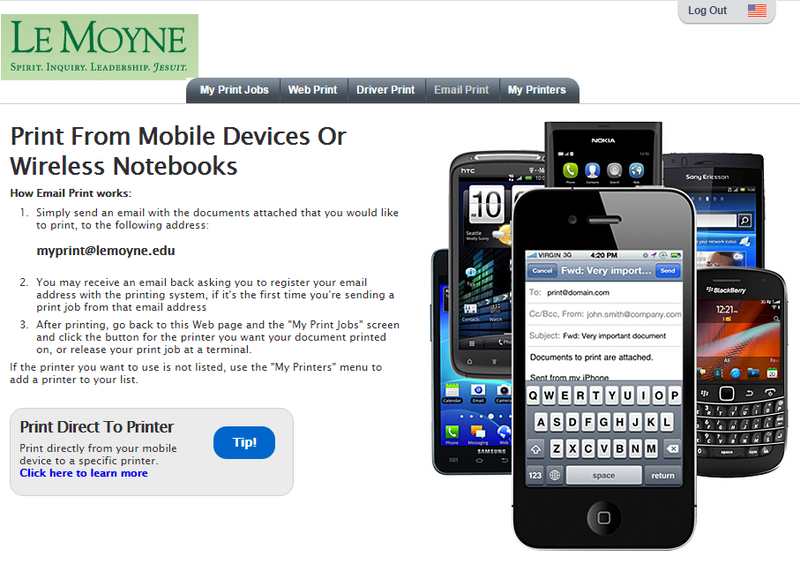 You can not use the MyPrint service to print to departmental or office computers.